Highly inhospitable desert areas are home to succulent plants, which are locally used although they are not a real economic resource here. 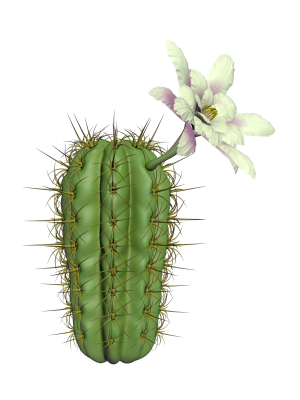 The dried stalks of cactuses and the stems of the opuntia are stripped of their thorns and used in lightweight buildings in completely bare areas. Some desert plants are used as food: for instance the young stems of the opuntia are a traditional dish in Mexico and Texas. The fruits of some species of cactus are also edible: the best known one is the fruit of the Opuntia ficus-indica (prickly pear) which, as other species of opuntia, is grown for its sweet fruits. The fruits of the date palm (Phoenix dactilifera) of the Saharan and Middle Eastern oases have a high energy content and can be eaten either fresh or preserved. Each palm tree can yield 80 to 150 Kg of dates a year. But other parts of this tree are used as well: its trunk for instance is used as fuel and in building, as a substitute of beams in houses; its leaves are used to build mud huts and windbreak hedges. As well as date palms, vegetables, pulses, cereals, almond trees, olive trees, citrus trees and fig trees are also grown in oases.